NEW YORK CITY (June 1, 2018) – Last night, warriors and supporters were honored at the Wounded Warrior Project® (WWP) Courage Awards & Benefit Dinner® at Gotham Hall. This annual gala recognizes the service and dedication of those who make WWP’s mission possible and inspire others to do more for our nation’s wounded warriors. Three awards were given out during the evening, each recognizing the efforts of those who have gone above and beyond supporting the needs of warriors. U.S. Army veteran Andrew Coughlan received the Courage Award, which is given to a warrior, family member, or caregiver who embodies the WWP core values of service, integrity, and loyalty. Longtime WWP partner USAA® received the Empowerment Award for their commitment to going above and beyond supporting the needs of our returning warriors. And Tom Cocchiarella of St. Paul, Minnesota received the Service Award for his continuous efforts at the local level to rally supporters for WWP. Funds raised through ticket sales, donations, and the online auction will help empower warriors served through WWP’s free programs and services. Since 2003, WWP has tirelessly advocated for our nation’s finest, improving the lives of over half a million warriors and families. 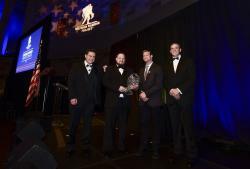 To learn more about how WWP is changing lives, visit http://newsroom.woundedwarriorproject.org/. And to see pictures from the Courage Awards & Benefit Dinner, visit http://mm.gettyimages.com/mm/nicePath/gyipa_public?nav=pr585438388.